Let me start by saying, thank the universe that French tipped acrylic nails are on the outs. Finally. If you look at trends with nails these days, color is in! Not only that, but designs that are all over the nail and not just the tip. And, shorter, realistic looking nails, rounded and filed are looking good. I was never a fan of acrylics, I got them like 2 or 3 times, and sure they look cool and are fun to have long nails, but they hurt! A lot! Getting them put on, taking them off. And they ruin your natural nails (my mom tells me she wishes she had not done them consistently for years, because now her nails have serious ridges) and they just don’t look natural. So following all the wondrous posts on Instagram and Pinterest of the amazing nail art that is taking place by individuals, not by overpriced nail salons, I finally took the time to play with some of the ideas. Of course my research paper hasn’t started itself yet. But I haven’t tried any fun designs in SO long. Last time I attempted nail art I couldn’t find my skinny brush. So I set out to make a new one. 1. Wipe off the polish on a paper towel or something. I used a magazine page. 2. 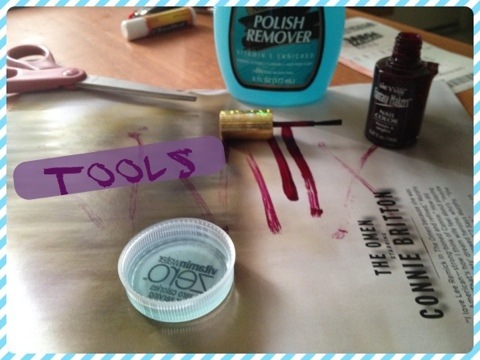 Start swimming your brush around in the nail polish remover. This part takes awhile to get it all out. I also alternated with warm soapy water. 3. Wipe the brush on a paper towel to get the paint off. 4. Just keep alternating until it feels pretty clean. 5. Separate sections of the bristles and cut them off. I did small sections so I could feel out how small I wanted. 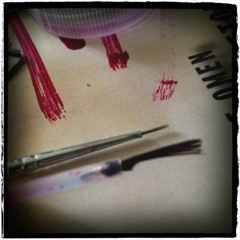 In the process of searching for an old bottle of polish worthy of tossing I found the brush I had paid for. 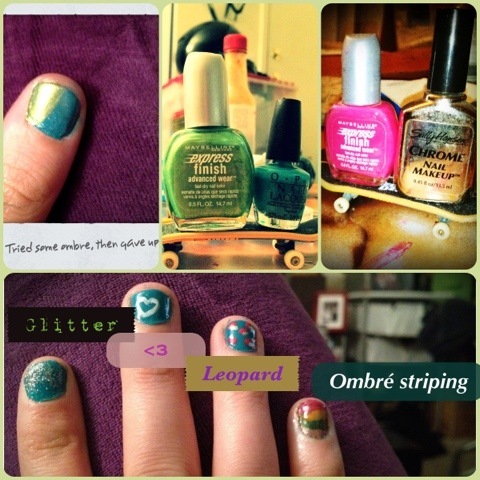 So I tried out some fun designs: leopard, heart, glitter fade, and ombré stripes. I remember in 6th grade when I went to friends’ houses to paint nails being faced with the inability to choose a color, because they usually had more than me and of course different colors. So I would paint all my nails different colors, much to the frowning of my mom. The same thing happened a month or so ago when I my friend and I had a ladies night of cupcake baking, mimosas, and nails. She had probably 3 times as many colors as me, so of course I couldn’t decide again. Today I figured I would give in to my inner child and just try them all. The results may be rusty and silly, but I had fun.